Disconnect fuel level sensor unit/fuel tank temperature sensor harness connector (1). Hold connector with your fingers, because there is no tab for releasing stopper. Pull it out straight downward. 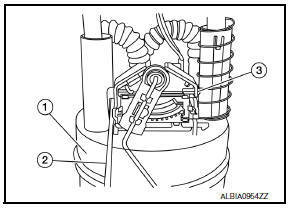 Remove fuel tank temperature sensor (2) from fuel filter and fuel pump assembly (1). 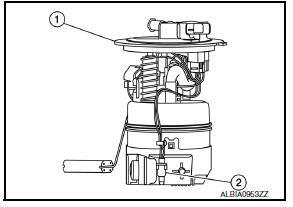 Using a suitable tool (2), remove fuel level sensor unit (3) from fuel filter and fuel pump assembly (1). Be careful not to damage the fuel level sensor unit. 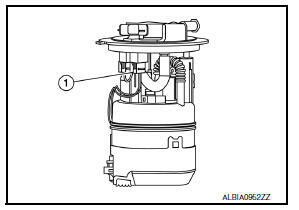 Do not disassemble fuel filter and fuel pump assembly. 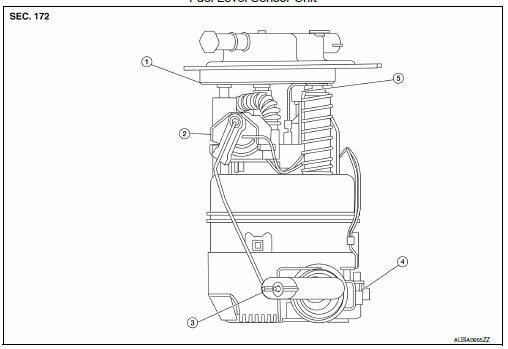 Check for damage of fuel level sensor unit installation position on the side of fuel filter and pump assembly. Slide fuel level sensor unit until it aligns to installation groove, then insert it until it stops. After inserting, apply force in reverse direction (removal direction) to ensure it cannot be pulled out. Connect fuel level sensor unit/fuel tank temperature sensor harness connector.